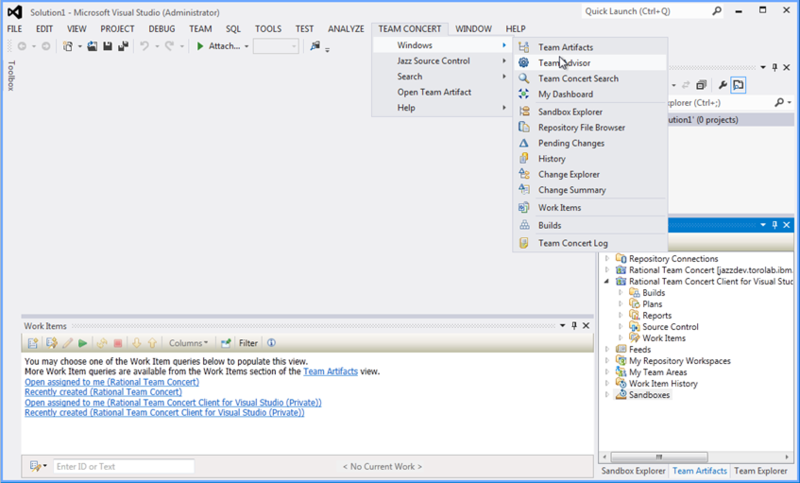 Rational Team Concert 4.0.1 "New and Noteworthy"
The Rational Team Concert installer enables you to install the Jazz Team Server and several applications and client tools. See each section below for new and noteworthy information for each component. Starting in Rational Team Concert 4.0.1 M4, a new server download is available from the All Downloads page. This download contains everything you need to set up and run a Rational Team Concert server on Windows or Linux operating systems, including Apache Tomcat, the Jazz Team Server application, the Change and Configuration Management (CCM) application, and trial keys. Download and extract the files, and follow the steps in the server setup wizard. The performance of the Rational Team Concert planning web UI is improved for working with a large number of planned items. For plans with hundreds of planned items, loading times should be at least 25% faster. Many server-side optimizations were implemented as part of this effort, and tracing support was added to help profile the performance of the planning web UI. When you drag items to rank or move them in a plan, the screen now automatically scrolls when the cursor is at the bottom or top of the plan. With this improvement, you no longer have to manually drag the scroll bar, and you can move items across large plans. You can now add "decimal" type custom attributes to your work items. After you add an attribute to the editor, you can view and edit decimal numbers in the work item editor. You can also perform bulk edits on a decimal attributes by using the query results view. In the Work Item editor in the Client for Microsoft Visual Studio IDE, you can select the associated change sets that you want to open or accept. To select one or more change sets, press Ctrl and click the change set or change sets. After a bug is fixed, ask one of your peers to review your changes. You can either mention the reviewer in the work item that you resolved, or set an approval. The reviewer is notified and can open the associated change sets. Then, the reviewer can then go through every file that was modified and open a compare editor to view the combined changes for that file. In the previous example, the reviewer double-clicked the MobileWebView.java file to open a compare editor that shows how the selected change sets combine to modify that file. The Change Summary view might look familiar because it is based on the Change Explorer in Show Files mode. The previous Change Explorer view supported two modes: "Show files" mode, which focused on file changes, and "Show change sets" mode, which focused on comparing sources such as streams and workspaces. In 4.0.1, "Show files" mode has richer capabilities, such as the Details pane, and is in the Change Summary view. In certain situations, viewing the combined changes from the various change sets does not provide a clear picture. For example, a reviewer might want to understand which individual change sets modified the file MobileWebView.java. To review detailed changes, from the Change Summary menu, click Show details pane, as the next image shows. In the previous example, the MobileView.java file was modified by all three change sets that Christophe created. Each change set has a comment, which explains the purpose of each change set. The dependency graph shows the ordering of the change sets. To gain a progressive idea of how the whole bug was fixed, a reviewer can double-click each row to inspect each change. Developers are often asked to review the changes that are associated to a work item. If change sets are missing, the new Change Summary view detects inconsistent situations automatically. 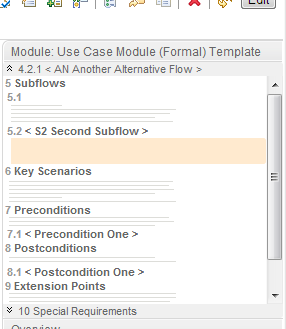 In the previous example, the reviewer selected the change sets that are associated with the work item to review and clicked Open. The Change Summary view shows which files are modified by those change sets. The MobileWebView.java file is flagged with a red square and the following description: in 2 disjoint change sets. The MobileWebView.java file is modified by two change sets that are not related to each other because they refer to unrelated versions of the MobileWebView.java file. In this case, the Details pane opens automatically and shows the change sets that have a gap. The dependency graph is disconnected, as shown by the broken green and red graphs. In the work item, the reviewer can ask the developer if he or she has forgotten to associate a change set with the work item. In this case, the developer associated a change set with a different work item by mistake. After the developer moved the change set to the correct work item, the reviewer could review the three change sets together correctly. Note: In certain situations, disjointed change sets are expected and perfectly valid. For example, disjointed change sets are expected when a developer has to check in multiple change sets intertwined with deliveries from other team members. In that case, the reviewer must review each disjointed change set by using the Details pane. Before 4.0.1, the Details pane did not exist. Disjointed changes were represented as multiple nodes in the Change Explorer view with no identifier as to which change set they originated from. In 4.0.1, the Change Summary pane and the Details pane provide more comprehensive information in these situations, making code review both efficient and safe. 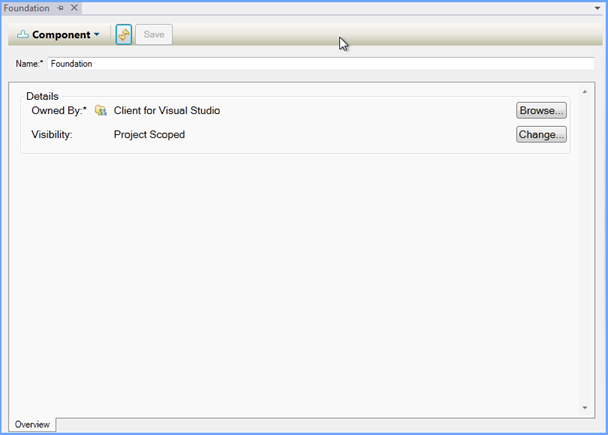 Instead of a Details pane, Rational Team Concert client for Microsoft Visual Studio IDE provides the Change Summary view, as illustrated in the next image. This feature was jointly developed in 4.0.1 by a feature team that worked simultaneously to develop the server, the Eclipse client, and the Client for Microsoft Visual Studio. In earlier releases, different component teams were responsible for adopting new features, usually in different milestones. 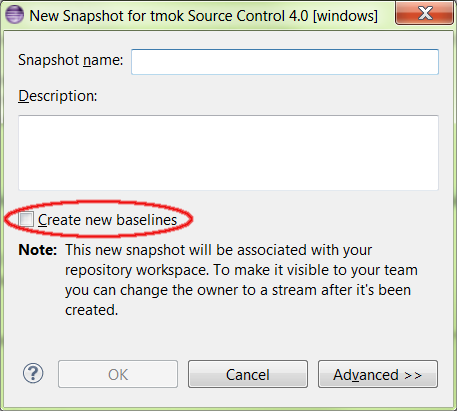 When you create a snapshot, the Client for Microsoft Visual Studio, Eclipse client, and command-line client now support the creation of new baselines in components that do not have changes. You can create a snapshot where all of the baselines have the same name. 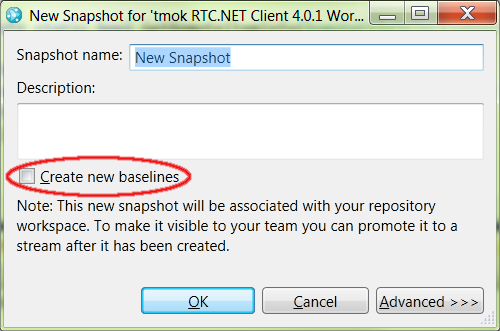 The command-line client has a new option that forces baseline creation when you create a snapshot. You can compare the state of an artifact in a snapshot with its state in a workspace, stream, or another snapshot. You can compare the state of an artifact in a baseline with its state in a component, workspace, stream, snapshot, or other baseline. If a baseline is specified by name, you must specify the component that is associated with the baseline by using the new -c/--component option. The new -c/--component command-line option was added to the diff command. You can use the new option to scope the list of artifacts that are to be evaluated by the diff command. by name, it is optional otherwise. The new -S/--show command-line argument has been added to the diff command. You can use -S/--show to display the difference in properties between two states of an artifact. Differences in user-defined properties will be displayed for all types of artifacts. For file artifacts, in addition to the user-defined properties, any differences in the built-in file properties, such as jazz.executable, jazz.mime, and jazz.line-delimiter, are also displayed. By default, when the -S option is not specified, only the differences in contents are displayed. +AfterStateProp - Value3: Indicates that the AfterStateProp property is present only in the after state of the specified file. -BeforeAndAfterStateProp - Value2 and +BeforeAndAfterStateProp - Value21: Indicate that the value of the BeforeAndAfterStateProp property was modified in the after state of the specified file. -BeforeStateProp - Value1: Indicates that BeforeStateProp property is present only in the before state of the specified file. You can now view and update workspace properties, such as name, owned by, visibility, and description. Successfully added the flow targets. Successfully updated the flow target. All components flow from/to this flow target. Workspace property was successfully set. You can now view and update component properties, such as name, owned by, and visibility. Component property was successfully set. You can now view baseline properties, such as name and description. Baseline property was successfully set. You can now view and update snapshot properties, such as name and description. Snapshot property was successfully set. +AfterStateProp - Value3: Indicates that AfterStateProp property is present only in the after state of the specified file. -BeforeAndAfterStateProp - Value2 and +BeforeAndAfterStateProp - Value21: Indicate that the value of BeforeAndAfterStateProp property was modified in the after state of the specified file. The Simple Team, Scrum, and Formal Project Management Process templates are now bundled with new process descriptions that can be edited using the Process Authoring capability. 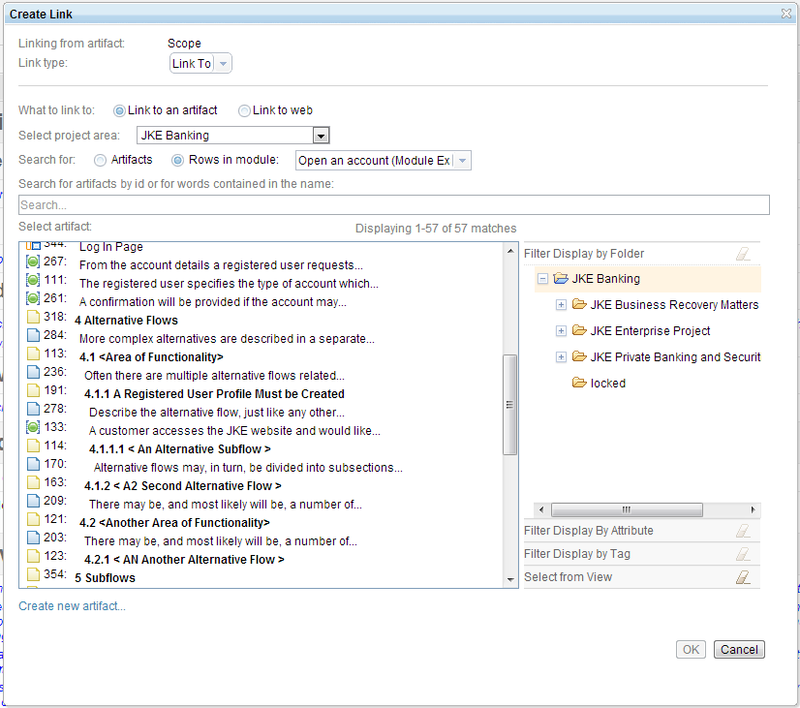 You can access the new process descriptions from both the Eclipse client and web client. 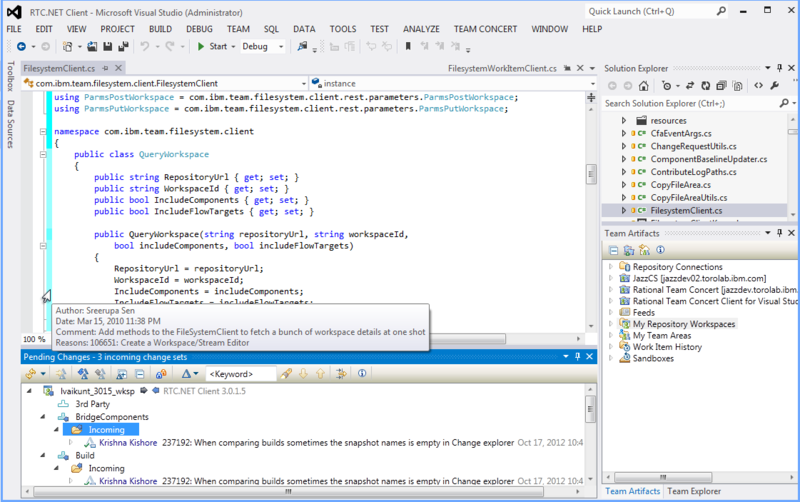 A component editor is now included in the Client for Microsoft Visual Studio IDE. You can use the editor to change the name of a component, the component owner, or its visibility. The work item editor now includes a quick information section. The section provides links to subscribers, change sets, and builds. 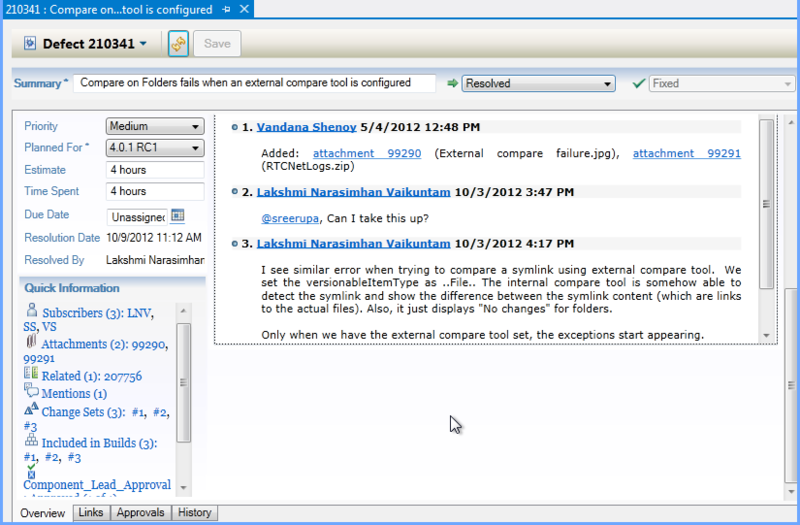 In the Team Artifacts view, the folders in the Shared Queries folder are reorganized. In addition, the performance of expanding the folders in the Shared Queries folder is improved. The Sandbox Explorer has a new toolbar. 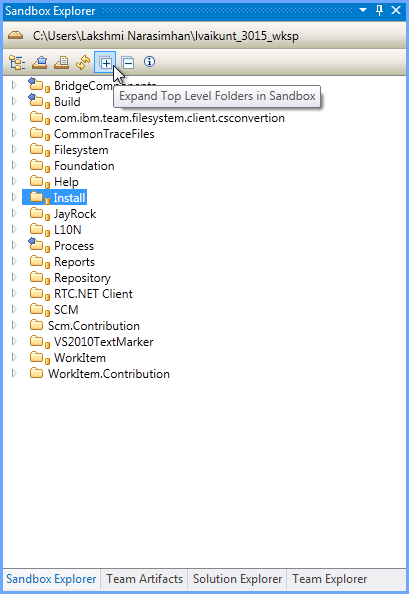 From the toolbar, you can generate load rules, collapse or expand all folders, and open a solution from the current sandbox. You can now use the ISPF client to abandon a build, cancel a pending build request, delete build results, and view the log files for a build. In the translator editor, you can now specify a pattern or a variable to override the names of the outputs. During a dependency build for z/OS® and IBM® i, the pattern is applied to the input name to generate a new output name, as the next images show. 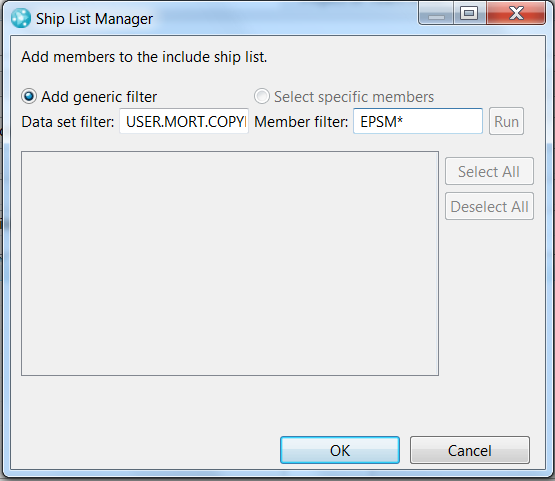 In the Package Definition for z/OS, in the Ship List Manager window, you can add a generic member filter with a partial member name and wildcard. All members that match the specified filter are packaged. With the ClearQuest Import wizard, you can export your Rational ClearQuest® records to a comma-separated values (CSV) file. 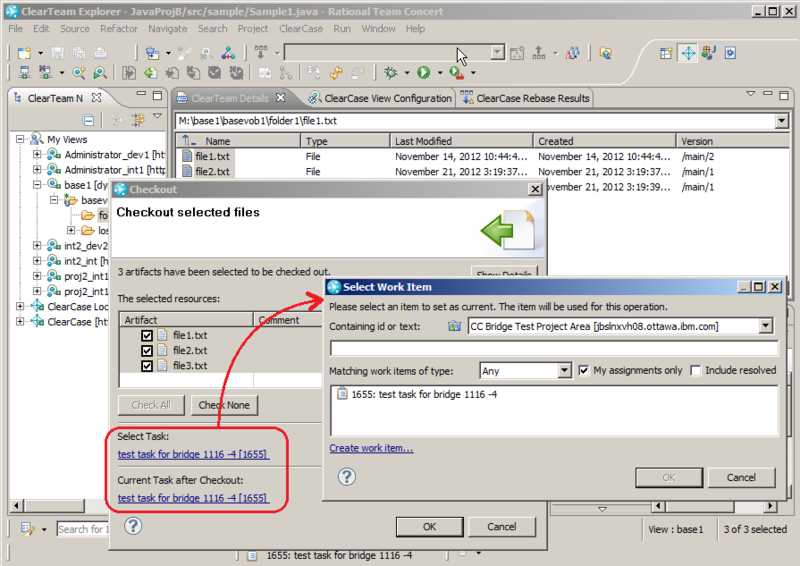 You can then import the Rational ClearQuest records to Rational Team Concert by using work items from the CSV importer. This feature is useful if you want to update work items that you imported from Rational ClearQuest after the related Rational ClearQuest records changed. Although the ClearQuest-Rational Team Concert Importer does not currently support updates, you update after an initial import by using this new feature. The task-centric user interface of ClearTeam Explorer provides another seamless integration of Rational Team Concert with Rational ClearCase. The My Activities view of ClearTeam Navigator now shows work items, rather than the UCM activities, that are assigned to you. You can open work items from there by double-clicking. Or you can select Work On from the work item to make it the current one in your ClearCase view. The drop-down boxes on the common dialogs (such as Checkout, Checkin, and Add to source control) also display work items instead of UCM activities. 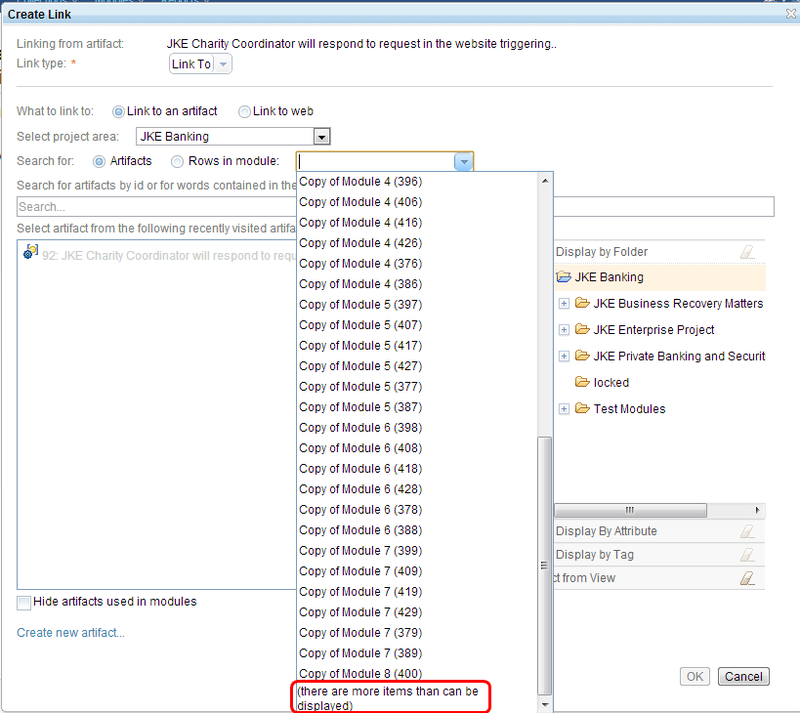 Selecting a work item in the dialog automatically creates a UCM activity and associates it. You no longer need to manually associate UCM activities with work items. The traceability of ClearCase assets by Rational Team Concert work items is now a built-in capability. In addition, the integration can now be enabled for each UCM stream basis. In the earlier version, individual developers could turn off the integration in the preference page. But in this new version, there is no exception to skip the integration when it is configured for the UCM stream that you work with. Rational ClearCase administrators or project managers are assured that every source code change is traceable by work items through the automatically enforced association between UCM activity and work item. For the stream configuration, you can configure what is displayed in the My Activities view by specifying a work item query. Note that the configuration of the integration is inherited by any child or descendant streams unless you set a different configuration. Please refer to Configuring the IBM Rational ClearCase Change Management Interface (CMI) for the UCM-RTC integration for more information on configuring stream integrations. This feature is only available with Rational ClearCase 8.0.0.5 or later. You can now choose a work item to associate base ClearCase versions from the ClearTeam Explorer common dialogs, such as Checkout, Checkin, and Add to source control . The ClearCase versions in the dialog are automatically associated to the work item during the operation. 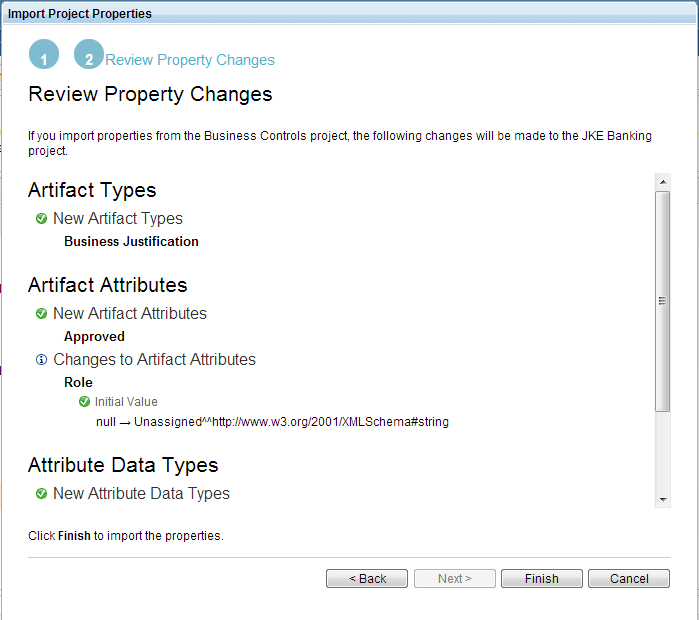 Change management type-binding data is now loaded into the data warehouse. After the data is in the data warehouse, the information is used by the reports that report on Defect type work items. The data is stored in the following data warehouse table: RIODS.REQUEST_TYPE_BINDING. The Defect Backlog and Defect Recovery Rate reports use the new change management type-binding data from the data warehouse to decide which work item type is the Defect type. When you migrate a repository to the new data warehouse, the initial ETL can take a long time to run because it needs to rebuild the trending and the historical data for the repository since its creation date. This initial ETL must complete successfully, or the server tries to run the ETL until it is complete. By default, each retry starts from the beginning. To avoid running the ETL from the beginning, you can break the initial ETL into 50-day chunks. To set the ETL into chunks, set the "Break-down Initial Load" Advanced Team Server Property to true. If the load after each chunk finishes successfully, on the Reports Admin UI, an entry is created on the Data Collection Job Status page. To have the ETL ignore large custom attributes, set the "Ignore Large Custom Attributes" Advanced Team Server Property to true. The Rational Reporting for Development Intelligence integration and workflow in the web UI has improved, especially for handling report parameters. This release includes new commands for getting and setting properties of source control artifacts, such as baselines, components, and workspaces. For more information, see scm command-line reference. You can use the new Change Summary view to review changes to files and folders and view information about individual change sets that modified a file or folder. You can also use the Change Explorer view to compare change sets in different workspaces, streams, snapshots, or baselines. For more information, see Reviewing changes in change sets. 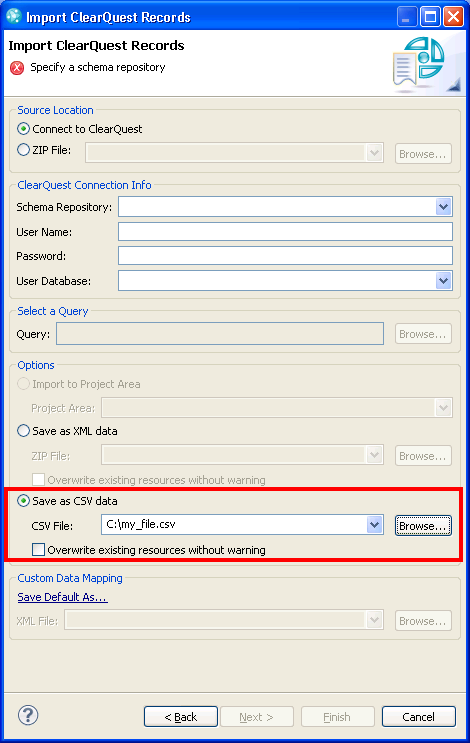 From the ClearQuest Import wizard, you can now export records to comma-separated-value (CSV) files. You can then use the Work Item Importer to create work items from the contents of the CSV files. For more information, see Migrating Rational ClearQuest records to work items. In the administrative web user interface, you can now use a template to specify the content of email messages that are sent to users when you invite them to join a project area or team area. For more information, see Specifying team invitation content in a template. The administrative web user interface now includes support for exporting process templates from project areas. For more information, see Exporting process templates. For Enterprise Extensions builds and source control, you can now use patterns to control the naming of translator outputs. For more information, see Translator pattern output rules. The ISPF client includes new actions for abandoning, canceling, and deleting builds, and for viewing build log files. For more information, see Viewing build results. 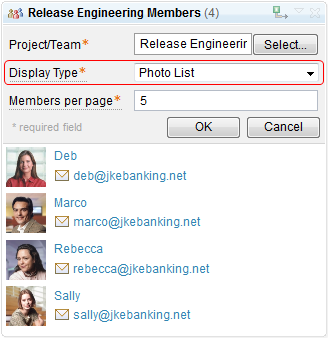 This release adds support for integrating Rational Team Concert with releases of Lotus® Sametime® 8.5. For more information, see Connecting to local Sametime applications. In the Team Members widget, you can now display contributors by using the new Photo List presentation mode. 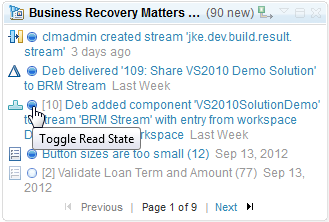 From the Feeds, My Work Item Changes, and Project & Team Events widgets, you can now manually track the read or unread state of feed entries on the Mini Dashboard and Personal Dashboards. The command verifies that the mapping file meets the formatting requirements and looks for common errors, such as missed mapping pairs. If problems are identified with a mapping file, warnings are displayed in the console window and the repotools-jts_verifyURLMappings.log file. The server rename feature is now fully supported by Microsoft SQL Server. After a server rename, but before you begin running the servers again, you can verify your data. After the rename is complete, a wizard guides you through all the key URLs in your deployment, such as public URLs, registered applications, friend links, and project area links. While the wizard is running, Jazz Team Server and the registered applications are in a special read-only mode so that you can browse data and look for broken links or incorrect URLs. After the application rename is complete, follow the steps in the wizard. 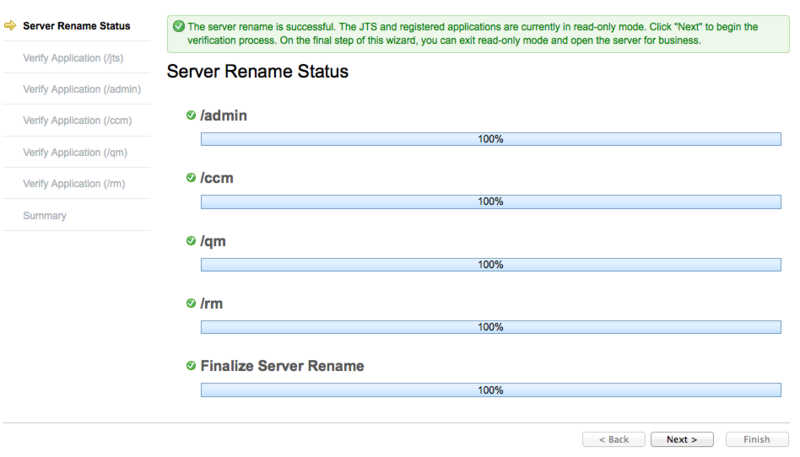 On the last page, if all the renamed data is correct, verify the server rename and start using the servers again. 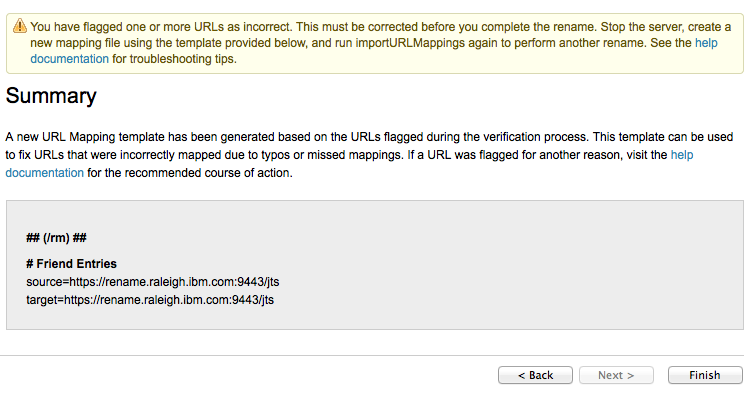 If you made a mistake, you can flag the URL in the wizard, and the wizard displays instructions to fix the problem. You can use a new REST service to create and manage server alerts. You can use alerts to inform users of important system-wide events, such as scheduled outages or server renames. The messages are displayed in the upper-right corner of the web client, and multiple alerts scroll within the banner. To see a more detailed message, hover over the alert. 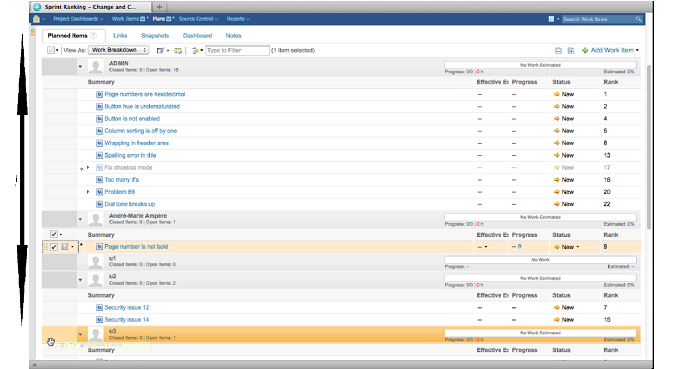 The project and team area editors in the web client now support viewing and editing preconditions and follow-up actions. This feature is currently adopted and available in Rational Quality Manager. Rational Team Concert 4.0.1 includes early support for fine-grained customization that allows project areas to extend a shared process without cutting off inheritance. By defining small configuration deltas to a shared work item configuration, projects continue to inherit changes to the shared process instead of completely overriding it. Current plans include further enhancements to this	feature in future releases. For more information, see Fine-grained Customization of Configuration Data. The project and team area editors now support adding multiple users at one time and assigning all users a set of roles. The members section of the project and team area editors now supports adding and removing roles for multiple members in one action. The project area editor now supports configuring an email template for a team invitation in the web client. You can now export and download a process template from a project area in the web client. Unlike the Extract Process Template feature in the Rational Team Concert Eclipse client, the web client directly exports the template as an archive without creating a new template in the repository. Users who are familiar with the existing support in the Eclipse client are encouraged to try the web client support instead. The process description viewlet now supports displaying a practice, practice element, and the content of a section or field. The team area editor in the web client now supports changing the timeline of a team area. 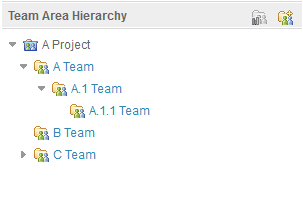 The team area hierarchy in the project and team area editors in the web client is now a navigation tree that can collapse and expand. You can scope RDF indexing rules to a specific storage area. The indexing rule is applied only if a resource in the specified storage area is being indexed. 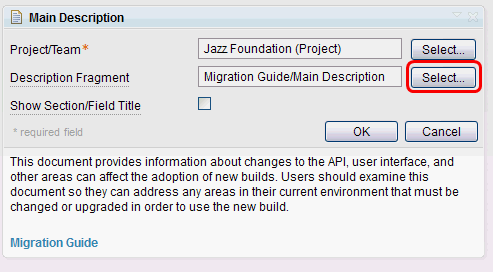 For more information, see Jazz Foundation Indexing RDF for Query. The 4.0.1 release supports two approaches to capturing images to use in manual tests. The first approach is the same screen capture capability for work items, which is a Java Web Start application that opens from your browser when you start to insert an image into a script. The feature enables you to capture an image with a configurable size and then mark up the image before you insert it into a manual test step. See the image below for the icon in the script editor to insert screen captures. In the second approach, which is specific to Mozilla Firefox, you insert images from your clipboard into manual script steps. In this approach, you can use your favorite tool to capture an image, copy it to your clipboard, and then paste it from the clipboard into your script step. Many testers have used spreadsheet programs for test tracking and expect similar functionality from Rational Quality Manager. The 4.0.1 release has new editing capabilities directly in the table views, which enables you to change most fields directly in the table, as shown in the image below for Browse Test Cases. The 4.0 release introduced progress bars, which you could use to quickly run a query and to track your progress toward validating a deliverable. In version 4.0.1, you can also see your progress based on priority to ensure that you complete all high-priority testing and that your team is focused on the right areas. In addition, version 4.0.1 has support to track progress against custom categories. In many cases, you might not be able to run a test in the current iteration, or you might need to repeat regression tests for tests that failed in a prior iteration. A new shortcut makes it easy to run test execution record filters, such as "result", and then copy these filters to a new iteration. In earlier 4.0.1 releases, you could filter test case execution records by test case categories. Now, test plans were added to the test case table views so you can quickly see which test plans a test case belongs to, find orphan test cases, and so on. 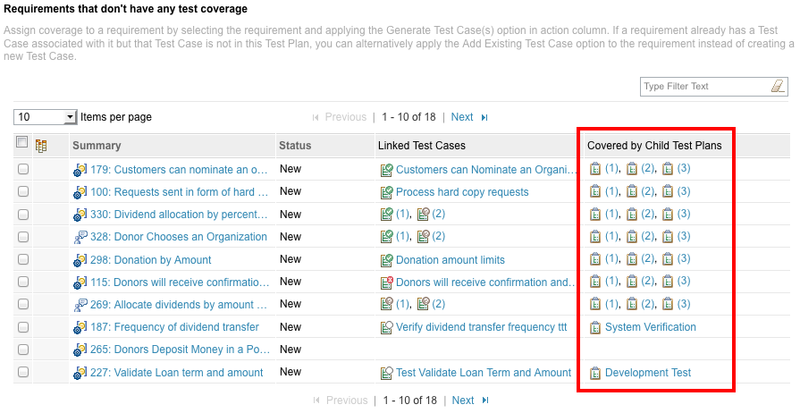 In addition, you can filter the list of test cases by test plan. Categories are a good way to organize data so that you can quickly and efficiently find what you are looking for, especially if you have a large number of data pools. For example, you might want to add a "type" category to easily locate a specific kind of test data. Customer feedback has expressed that data pools would be more useful if a single, large data source could cover different aspects of testing. The 4.0.1 release addresses this problem in two ways. When you run a test that has an associated data pool, a new run option is available, as shown below. 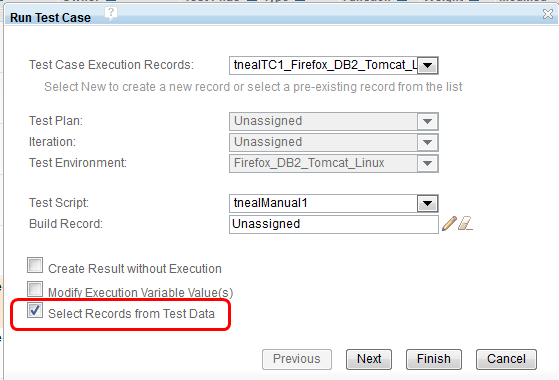 If you select the Select Records from Test Data check box, a dialog box opens that you use to select the rows to iterate over while running the test. The test data records that you can filter are displayed. Only the selected rows are used during that run. Step results include the test data that was used, which provides traceability into which data was actually used when running a test. Based on your process settings, you can override this record selection criteria before starting a test execution, which allows for more flexible test data at run time. In the 4.0.1 release, you can select records from the data pool when you construct test scripts and test cases. With this approach, you can use the same test script in multiple test cases but vary the data, which allows for more reuse. 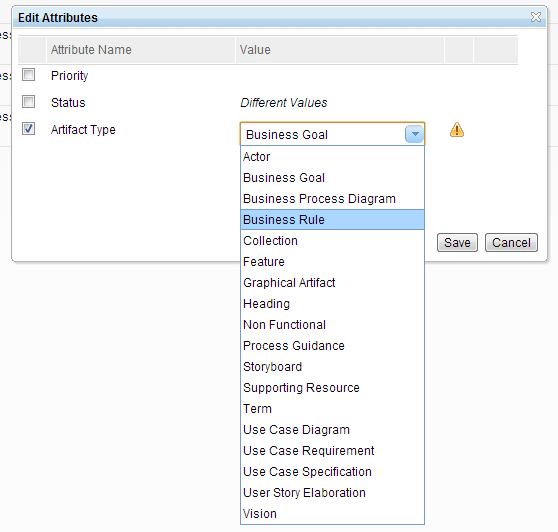 You can define record selection criteria based on the columns that are available in the test data. After you define this criteria in the test script, you can override it at the test case level. Being able to see test results in specific test case categories is important for tracking progress and results against specific goals. For example, you might want to see your results for a specific product (captured in a category) from test cases that span multiple test plans. The 4.0 release included support for scoping test artifacts to team areas, but you could not view that data in tables. Now, you can sort, query, and bulk update this important data. When a test plan is linked to a requirement collection, it is often useful to see which test cases are linked to the requirements in that collection. 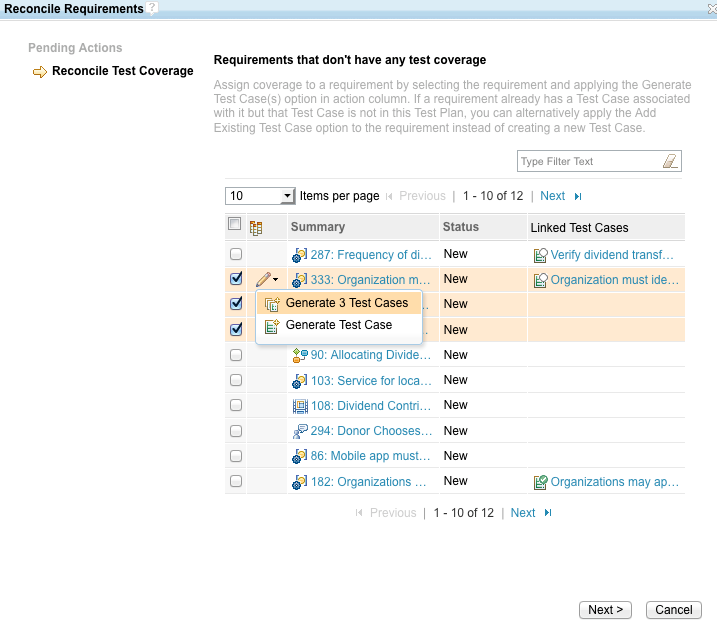 The Requirement Collection Links section of a test plan now provides a Coverage view that you can use to quickly determine which requirements are covered by a test case in the test plan, and which are not covered. When a requirement in Rational DOORS is linked to a test case or test script step in Rational Quality Manager, the label of the link is now easier to understand. 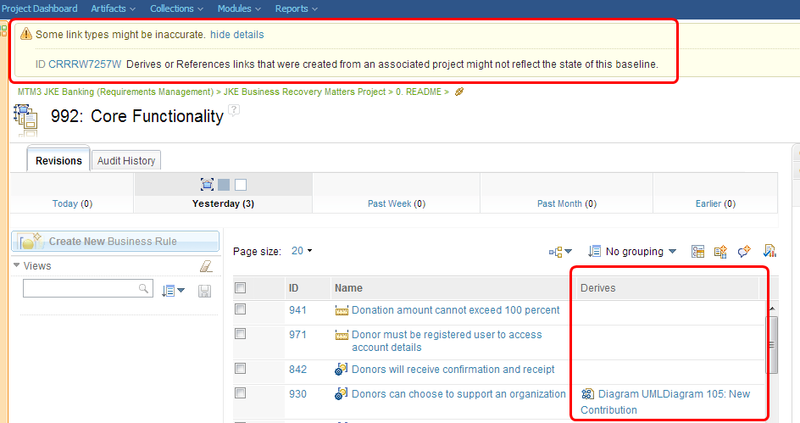 Several usability improvements were introduced into the Reconcile Requirements feature in the Requirement Collection Links section. The panels were simplified and you can now generate test cases directly from the table view. 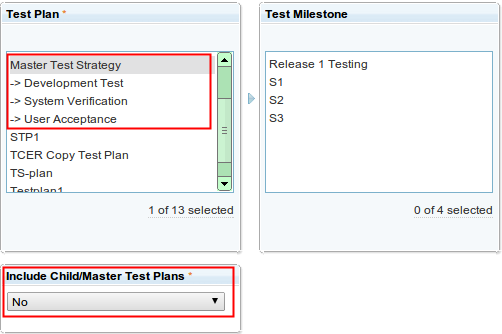 When you reconcile a master test plan, you can now see which requirements are already covered by its child test plans. This feature is only supported if Rational Quality Manager is integrated with a requirements provider (for example, Rational Requirements Composer or Rational DOORS) using the Open Services for Lifecycle Collaboration (OSLC) specification. In certain cases, a test artifact might contain links to remote requirement and change management artifacts that do not contain links back to the test artifact. When this occurs, an icon now indicates that the back link is missing from the remote artifact, and if needed, you can create the back link. You can enable this feature from the List View settings in the User Preferences window. Several new features in this release support regulatory environments. With the addition of the Required Approvals precondition, you can customize the requirements for state transition with the number and role of the approvers, as well as other attributes. 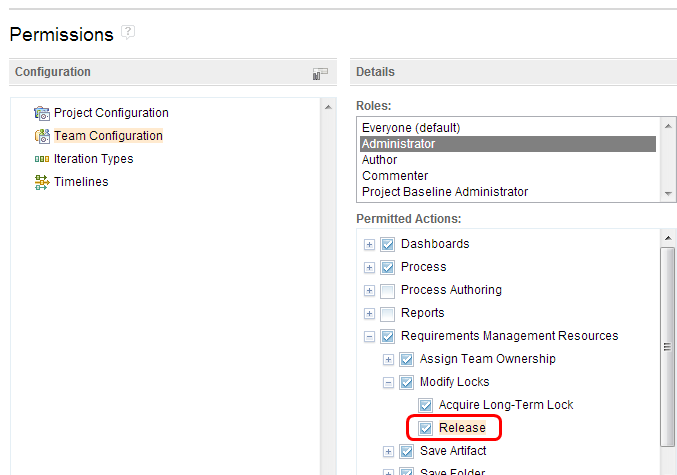 You can now enable automatic state transitions by using the new Approval Trackings feature. This feature allows the customization of an automatic trigger to change the test artifact state based on the state of the formal review approvals. Test artifacts can now be automatically locked from editing based on the test artifact state. You can now set a new precondition that prevents further modifications to an approval group after that group is completed. The management of approval groups was improved with the ability to archive and copy any existing approval groups. Archived groups are still visible, but are not evaluated by any process preconditions. One aspect of process customization is the configuration of process advisors, which are configurable policy checks that are invoked when running certain operations. The 4.0.1 release provides a new precondition for running manual tests: Require an Actual Result for Script Steps. 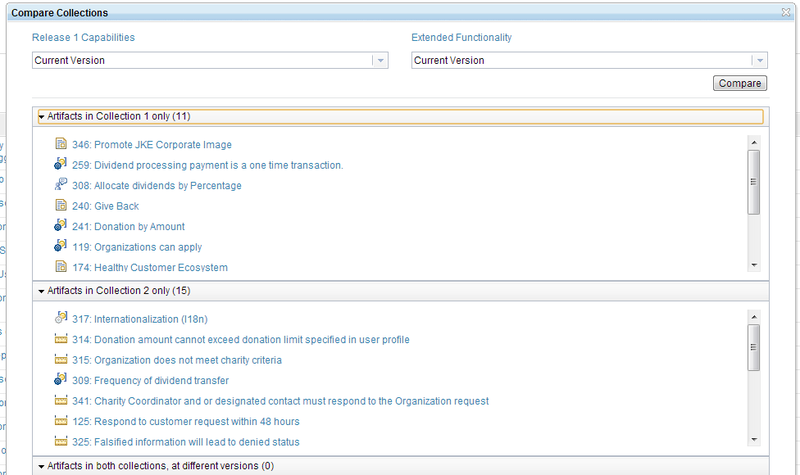 This precondition is configurable through the new web UI for preconditions and follow-up actions. After you set the precondition, it is enforced when you run a manual script or edit a result. If the condition is not satisfied, you are prompted and unable to commit the result. This precondiiton gives you better control over what is captured when you run a test. Note the three configurable options to enforce the actual result: Failed, Blocked, and All steps. To adopt new data warehouse schema changes for Rational Reporting for Development Intelligence 2.0.1, Rational Quality Manager updated the .xdc file and provided a new ODS job in the 4.0.1 release. Now, if you use Rational Insight, you should start to run the jobs under the Build and JobStreams/Jobs/RQMJobs/RQM4_Jobs/RQM4.0.1_Jobs folder in Data Manager to populate ODS data into the data warehouse database. Reports can include test case counts of a test suite result for each test case execution status. 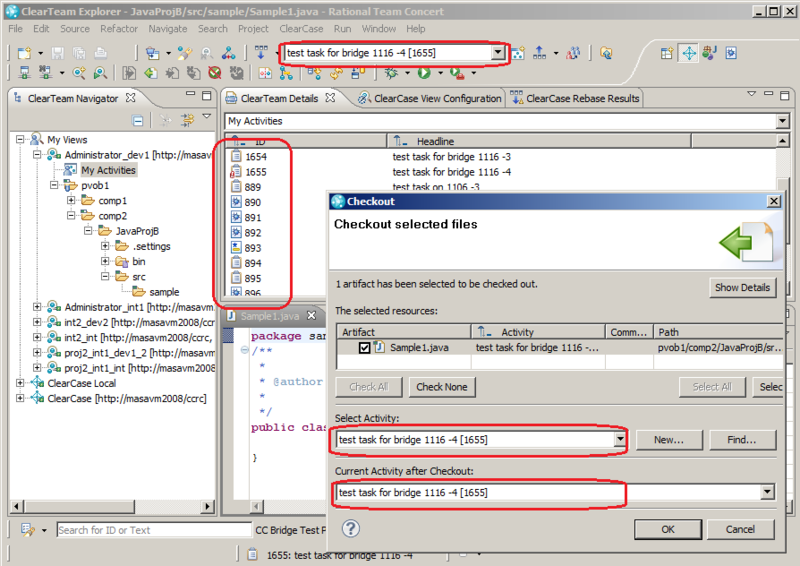 Reports can include points deferred and points permfailed of a test suite result. Reports can include detailed information about a lab resource in a test case result. 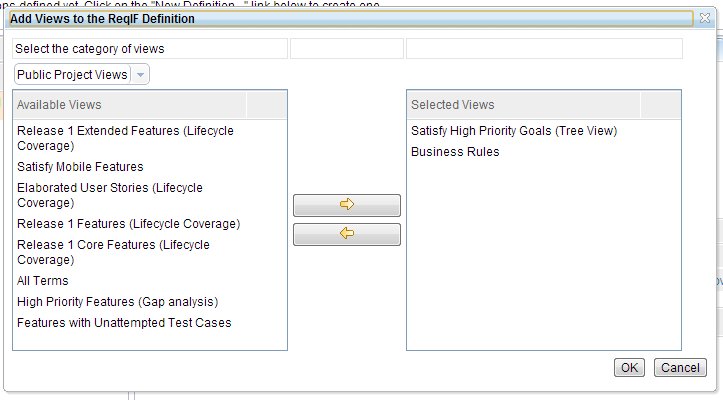 Reports can include the customized test priority for a test plan. Reports can include the creation date, estimate, and customized test priority of a test case. Reports can include the creation date, estimate, and customized test priority of a test suite, and the execution owner of each test suite element in a test suite. Reports can include the estimate, time spent, and customized test priority of a test case execution record or a test suite execution record. Rational Quality Manager supports a master-child relationship between test plans and, in previous releases, this relationship could not be evaluated in BIRT reports. In previous releases, all test plans were listed in the Test Plan parameter prompt, and there was no difference between a master plan and the child plans. To clarify the test plan relationships, test plans are now organized and sorted in a tree view by the master and child relationship. If some test plans have several child plans, all these child plans are listed under this master plan. Another parameter is added to control whether the master-child relationship is evaluated. The default value is No, to make the default behavior consistent with previous releases. The report parameter prompt is shown below. With this enhancement, you can see only the result from the most recent iteration of all similar test case execution records (TCERs). In this case, two TCERs are similar if they have the same test plan, test case, and configuration but different iterations. 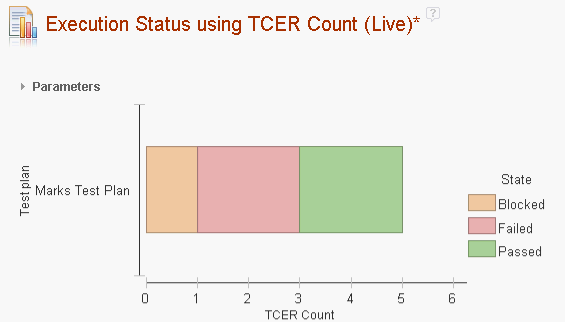 In the example below, you can see that two test cases contain a total of five TCERs. Test case 1 contains three similar TCERs and test case 2 contains two similar TCERs. 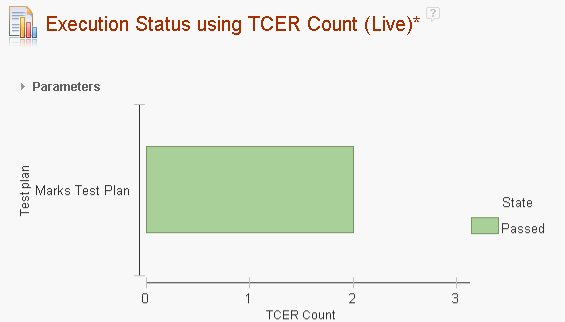 In version 4.0, running the "Execution Status using TCER Count" report yields the following output. Note that there are a total of five results with no way to distinguish which results are from the most recent iteration. It is impossible to know from this output the current state of testing for the similar TCERs. In 4.0.1, a parameter named "Most Recent Iteration Only" was added to some of the reports. If you select Yes for this parameter, the output of the report shows only the result from the most recent iteration of similar TCERs. Note that only the passed results from the most recent iterations are included in the report below. These include iteration s3 of test case 1 and iteration s2 of test case 2. When the master-child plan relationship is not enabled, as in the default setting, the report works as it did in previous releases. 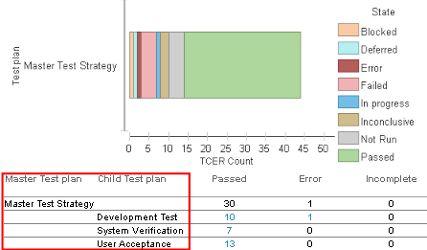 When you set the "Evaluate Test Plan Master-Child Relationship" parameter to Yes, the report rolls up child test plans artifacts as part of the selected master plan, and shows the total status by master plan, as shown below. In the following example, timings are shown for the RQM4StateGroupETL, which takes 0 ms for inserting, 590 ms for updating, 41 ms for looking up, 711 ms for fetching, and 1069 ms for running the whole ETL job. Version 4.0.1 provides a preview implementation of an Open Services for Lifecycle Collaboration (OSLC) automation service provider. For more information see the OSLC automation specification. The sample OSLC client at the Eclipse Lyo project contains a sample automation adapter that demonstrates how to register a test tool with the Rational Quality Manager server, poll for work, upload attachments, and post a test execution result. Information about the Eclipse Lyo project, including how to obtain the OSLC sample client, is available at Eclipse Lyo. In Rational Quality Manager, you can run test scripts by using test case execution records (TCERs) or test suite execution records (TSERs). You can trigger the test run manually through the web UI or through a command line interface. Usually, the automated triggering of a run is required in response to a new test target, such as a new software build. Many such automation harnesses are written using Apache Ant. In version 4.0.1, two Ant tasks were added to allow you to submit test case execution records or test suite execution records for execution. This addition lets you use tools that are written in Ant to submit test execution requests from within their native environment. You can find detailed usage information at the wiki that describes the Rational Quality Manager Execution Tool. In most cases, the default test adapters combined with the flexibility of the command line adapter is adequate. If you need a more richly featured integration with your test automation framework, you can use the Rational Quality Manager test automation adapater API. For more information, see the wiki and the information center. Locks provide more control over changes when a team is working on the same set of artifacts. Locks are displayed on the Artifacts page. When you encounter another person's lock, either by trying to edit a locked artifact or by trying to lock an artifact, a message like the following one is displayed. If you have artifacts that contain uploaded files such as image files, spreadsheets, or Adobe PDF files, you can lock the artifacts for an extended time so that you can download and modify them in other applications and then upload them again. 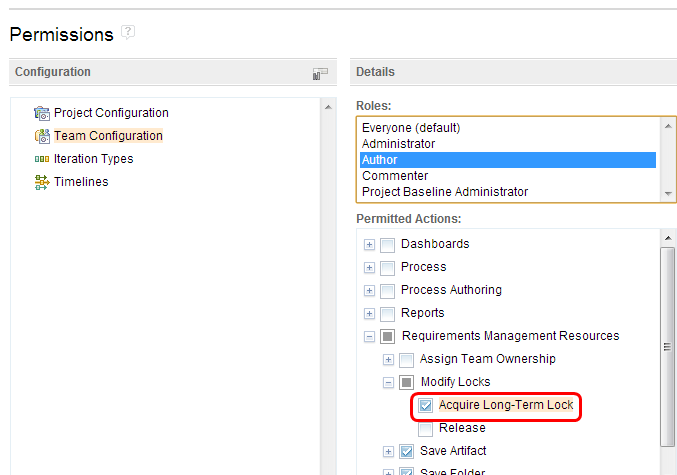 To lock artifacts for an extended time, you must have the Acquire Long-Term Lock permission, as shown in the next image. After you finish editing the file in the external application and upload the new version, the artifact is unlocked. If you have the right permission in a project or team area, you can release or override someone else's lock. To override locks, you need the Release permission, which is shown in the next image. To unlock an artifact, click the menu for an artifact and select Unlock Artifact. Alternatively, you can override a lock when you are notified that one exists. When you override a lock, you lock the artifact for editing, which prevents others from changing the artifact until you finish editing. 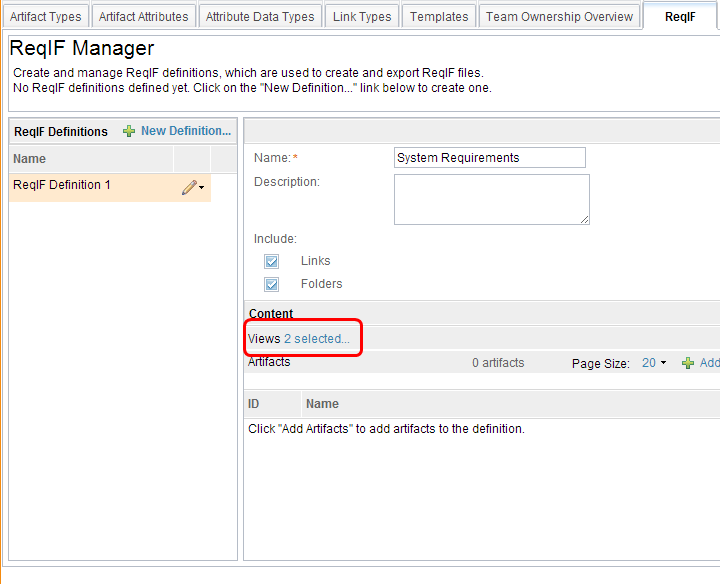 You can now specify additional attributes of linked artifacts to display on the Artifacts page. 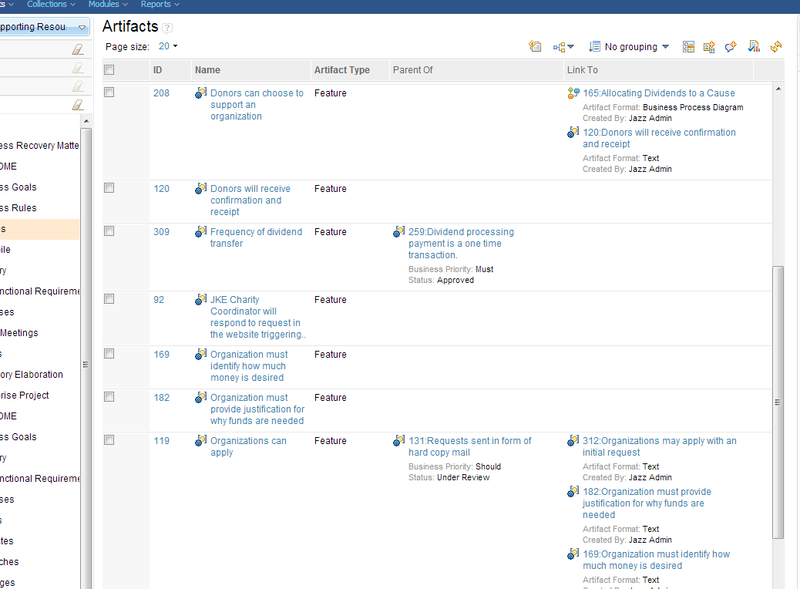 For example, in the following image, the Artifacts page includes the Link To column, which displays the traceability links and the artifact format and created by attributes of the artifact. You can specify which attributes to display in the Change Column Display Settings window, as shown in the next image. You can change the artifact type for several artifacts at a time. 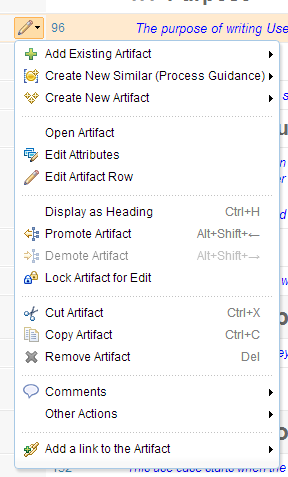 In the Edit Attributes window, select Artifact Type, and then select the new artifact type. You cannot change the artifact type and change the value of one or more artifacts at the same time. After you change the artifact type, you can change attribute values. In the Recent Changes widget on a dashboard, if you hover over the Delta icon, the specific changes in the artifact are displayed. In the web client, you can now paste more kinds of HTML data into textual artifacts. Previously, for example, if you copied and pasted part of a spreadsheet, an error message would prompt you to paste the data as plain text. 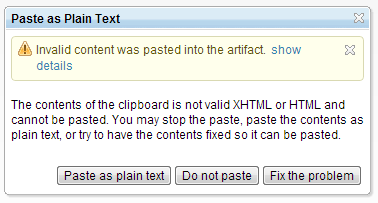 You can now convert the HTML data to the correct format to paste it into a text artifact. If you are pasting data and are prompted with a message about invalid content, you can click Fix the problem to convert the HTML data to the format of the Requirements Management (RM) application. You can also view the original and fixed versions, as the next image shows. If a file contains poorly formatted HTML data, the RM web client might not be able to convert the data. For browsers that support the pasting of clipboard image data, such as Mozilla Firefox and Safari, when you paste the image data into a rich text document, the image is automatically uploaded to the server and a resource for the data is created. This release includes a new artifact format: the module. A module is a structured document that is composed of multiple artifacts in a hierarchical, ordered sequence. In a module, the artifact headings are numbered according to their place in the module hierarchy. You can move artifacts in the hierarchy or make them headings. 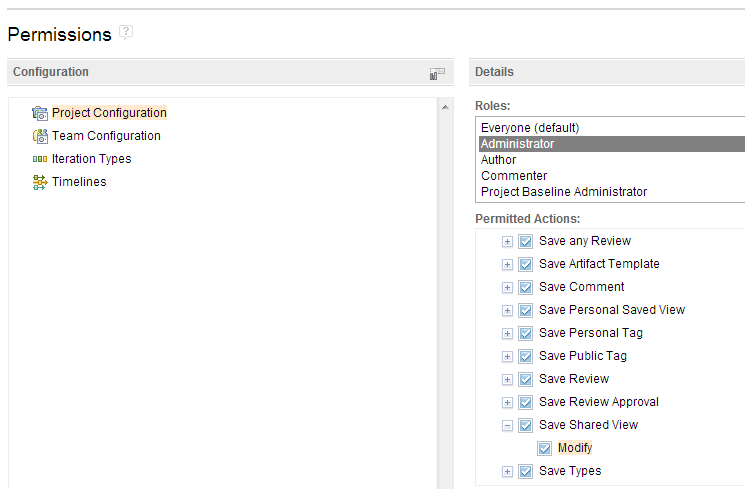 You can also add columns to a module to show attributes, tags, and links. You can save views of modules for later use. The next image shows an example of a module. You can browse modules by folder or by using filters, just as you browse other artifacts. 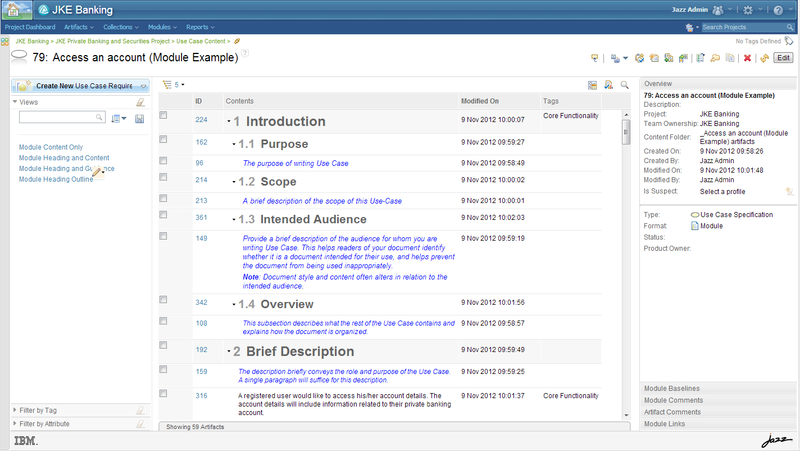 To gain different perspectives, you can also create views that show only certain information in a module. To access modules, use the Modules menu. 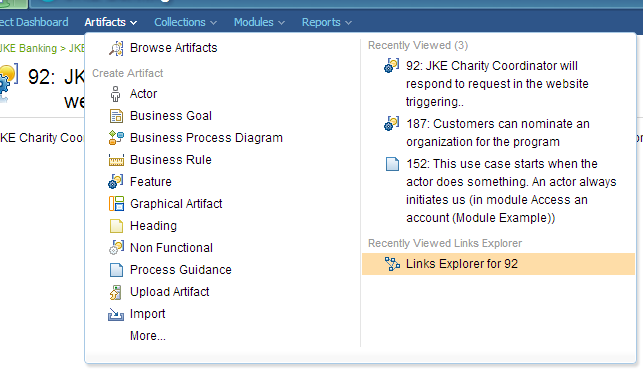 In the Create Link window, you can now create links to artifacts in a module. When you search for an artifact to link to, you can switch the scope of the search from repository-wide, which is the default, to within a specific module. When you search within a module, you select the module from a list, and the content of the module is displayed with formatting and indentation. All of the filters are available and apply to the artifacts in the selected module only. When you create a link to a module, if you click Rows in module, you can view all of the modules in the project. To filter the list, type a partial name. You can search for artifacts that are or are not reused in modules by using the new "Where used" filter. To search for artifacts that are reused in modules, click is any of or is all of, and then select one or more modules. To search for artifacts that are not reused in modules, click is not any of or is not all of. Keyboard shortcuts for module editing are displayed on the menu and submenus. For a list of keyboard shortcuts, see the "Shortcuts for the Requirements Management (RM) application" topic in the help. To change the current row to or from a heading, press Ctrl+H. To save the current row and create a similar artifact after the row, press Ctrl+N or Ctrl+Enter. To create a similar artifact below the current artifact, press Ctrl+Alt+N. To create a similar artifact before the current artifact, press Ctrl+Shift+N. To add an existing artifact after the current row, press Ctrl+D. To add an existing artifact below the current row, press Ctrl+Alt+D. To add an existing artifact before the current row, press Ctrl+Shift+D. To create an artifact and add it after the current row, press Ctrl+O. To create an artifact and add it below the current row, press Ctrl+Alt+O. To create an artifact and add it before the current row, press Ctrl+Shift+O. You can select multiple artifacts and change whether they are displayed as headings. Comments, links, and tags indicate whether they are related to the base artifact or the artifact that is in the module. 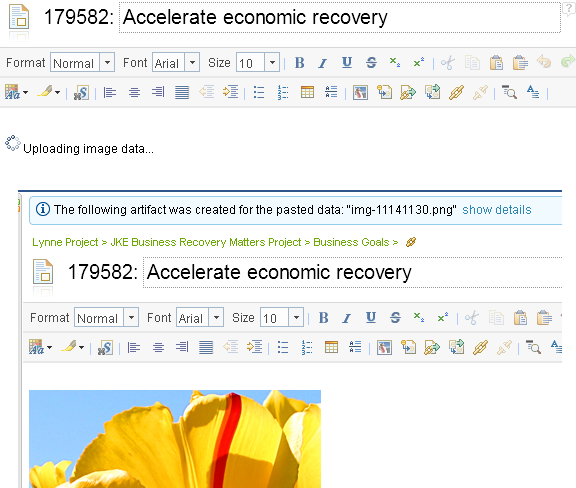 To display comments, links, and tags, click the Include links, tags and comments from base artifacts icon on the toolbar, as the next images show. You can print a module to an Adobe PDF file or a Microsoft Word document. If you use the links explorer and then go to another area of the application, the links explorer stays in the state that you left it in. 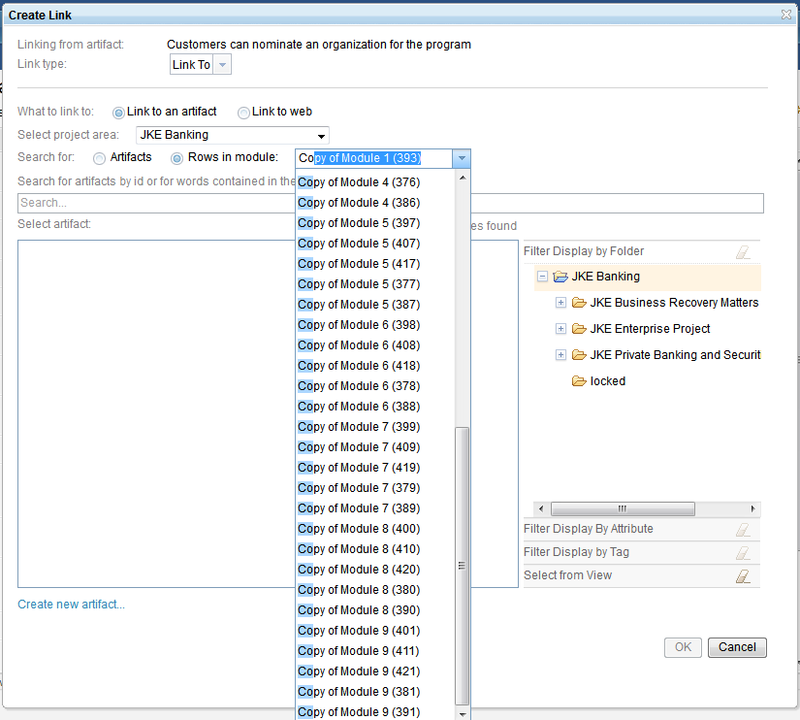 You can complete other tasks in the RM application without affecting the changes that you made in the links explorer. If you recently opened an artifact in the links explorer, you can access that artifact by clicking the Artifacts menu. The artifact is listed in the Recently Viewed Links Explorer section. The links explorer now also supports printing. In this release, you can continually export and import requirements data by using ReqIF. For example, you can use ReqIF to export requirements data so that a third party can modify it. Then, you can use ReqIF to import the data back to the RM application. After the import operation, the changes to the data are reflected in the RM application. You can now include project and module views in a ReqIF definition. For any module that is in the definition, you can add public project views, public module views, and module-specific views. In the window that opens, you can select the views to include in the ReqIF definition. The selected views are included in a ReqIF file when you export. When you import a ReqIF file, any views that are in the file are listed as selected views in the imported ReqIF definition. The list of artifacts in a ReqIF definition is now paginated so that you can more efficiently navigate the artifacts. You can also sort the artifact list by using the Name, ID, and Artifact Type column headers. 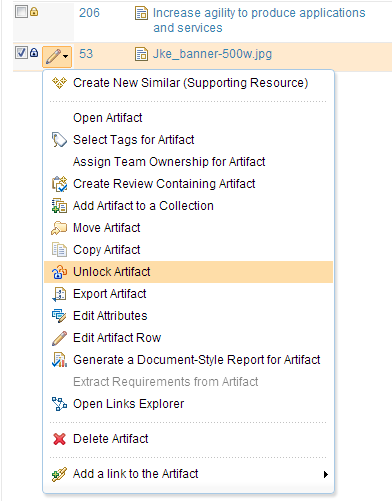 You can now create and remove links from a link column on the Artifacts page. 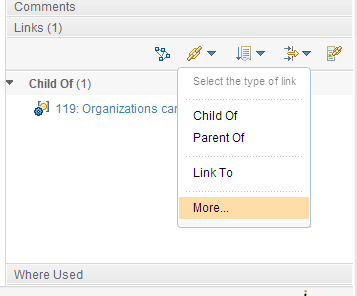 If you hover over the menu of the link column, the options to create or remove links are displayed. Those menu options are visible only to users who have the permission to create or remove links. You can set preferred link types for each artifact type to help your team create consistent link types between artifacts. An administrator defines preferred links as part of the artifact type definition. You can select individual link types or copy them from another artifact type. After preferred link types are defined, only those link types are shown on the menus that you use to create links between artifacts. Because only the preferred link types are shown, you and your team members can easily create appropriate relationships. To create other link types, click More. From the editor toolbar of a collection, you can now compare two collections or two versions of the same collection. You can compare baselined versions of the collection and the current version. You can view artifacts that are in the first collection only, artifacts that are in the second collection only, artifacts that have changed between the two versions of the collection, and artifacts that are the same between the two versions of the collection. When you compare two versions of a collection and an artifact has changed between those versions, you can view detailed information about what changed. The next image shows an example of the changes between versions. You can also compare two entirely different collections. You can no longer change the scope of a saved view. If you need to change the scope of a view, create a duplicate view and then set the scope of the new view. Your role now controls whether you can modify public shared views. To restrict the modification of shared views to certain roles, go to the project administration page and configure the permissions. By default, only the Administrator role has the permission to modify shared views. Suspicion profile selections can be saved for each user, and the selections can persist across browsers. From the Artifacts page toolbar or the editor toolbar for an individual artifact, you can use new icons to set suspicion profiles and view the suspicion profiles that are currently selected. Whenever a saved view changes the active suspicion profiles to show suspicion in the context of that view, a message indicates what the previously selected suspicion profiles were and what the newly selected profiles are. 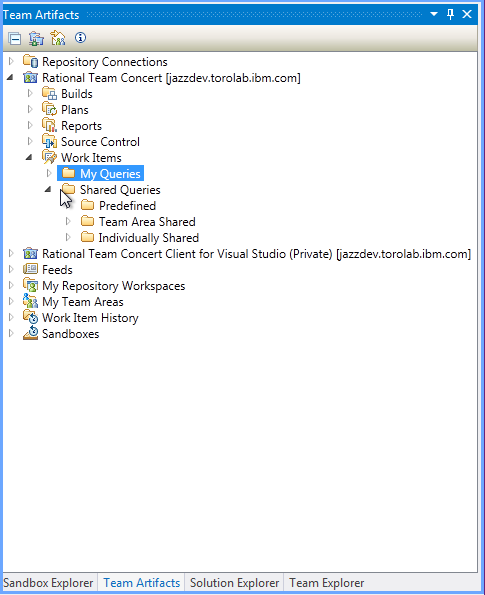 You can import project configuration properties from another project into your current project. By importing properties from another project, you can help administrators maintain consistent project configurations across an enterprise. 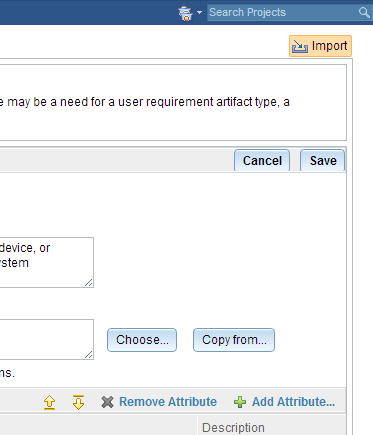 You can import the following properties: artifact types, artifact attributes, attribute data types, and link types. During the import operation, the import wizard guides you through the process. You can access the wizard from the Manage Project Properties area by clicking Import, as shown in the next image. After you select the project to import from, you can view a report that defines the changes that will be made to your project if you import. The next image shows an example report. References and Derives links that point to resources outside of the current project might be inaccurate when they are displayed in the context of a baseline or revision. Because a baseline or revision is local to the current project, the RM application displays the current link, which might differ from what the link state was when the baseline or revision was created. When those links are displayed in the context of a baseline or revision, a warning message is displayed. 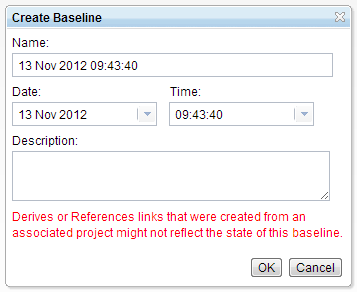 When a baseline for a project or module is created, a warning message about the links is displayed in the Create Baseline window.